Either by choice or simply because I failed to succeed there I decided to focus on countries other than the biggest market: the U.S.A. As a result, while never reaching the top #50 in U.S.A. some of my apps have ranked #1 in other countries including amongst others the relativiely big markets of France, UK, Germany, Spain, Japan and China. This has been a lucky move considering some ad networks (notably Admob and MobFox) tend to have higher eCPM for my apps in Europe. To achieve this localization was an absolute requirement. Once you use a streamlined system (such as iCanLocalize ) managing various languages isn't too hard, as long as your apps – like mine – do not hold too much text. If I need a new string, I'll just add it to my en.lproj strings file, upload it to iCanLocalize and pay only for the missing words, then in a few hours (or days) I'll download the resulting strings files for all languages. Now the thing I hate the most with an app that has 10 languages is that if you change something visible you need to update all the screenshots. Shudder. A: change the language in your phone 10 times and pick every screenshot again with the Organizer and then give it a proper name by hand. You could also change the language 10 times in your simulator (slightly faster) but then you'd have to crop your shots and have to worry about gamma issues or any possible difference between simulator and device. B: Upload each screenshot manually while insulting loudly the guys who designed iTunesConnect. A zip file with standardized names would be SO much faster... one can dream. I am afraid I can't do much about B, so let's keep cursing about this. However, there's a solution to improve the speed for taking screenshots on device, making more cursing optional but still enjoyable. 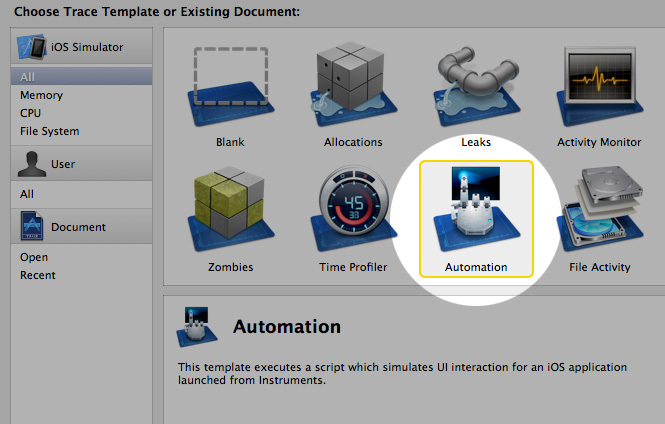 As the name implies, UIAutomation let's you automate your apps. This is primarily aimed a running Unit Tests but who needs them, we have user reviews for that, right? Here's a simple example script, showcasing some of the stuff you can do. Here we'll take two screenshots on two different screens. // Note that this will only take effect on next run. // So you have to run this twice. // Once to set the language, another to actually pick the screenshot. Here's the downloadable autoshot.js with the code above. It has a bit more logging than the code above too. Open your project In XCode, use the menu : Products -> Profile. The following screen will show up and you'll very wisely pick Automation, unless you have been speed-reading all along and you think this is about zombies. Select your .js script file and enable Run on Record. Enable Continous logging at the bottom and point it to an empty folder. I named mine 'shots' and put it on my desktop. taking screenshots just doesn't work from the simulator, so you have to run this on the real device. Overwriting the language in NSUserDefaults only affects the next run so for each session you have to define the language variable, run the script once and abort it (so it memorizes the language), then run it again to get the actual screenshots. Looping over all languages ? Not yet. As you might have noticed, the sad part here is you still have to run the script once in every language. I am still looking for a solution to update the language without having stop and restart the application but so far I haven't found a way. This would maket the full process 100% automated. Any suggestions ? 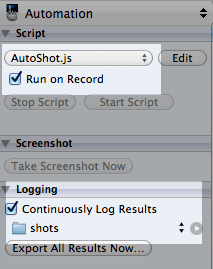 XCode 4.5+ fixed the issue where scripts wouldn't be able to take shots on the simulator. However, an issue remains: when taking shots from the simulator the language forced from the script isn't taken into account. Obviously the #ifdef DEBUG is a good security measure to make sure this never ends up in the final release if you forget to comment it. Hi Santiago, Can I use setPreferencesValueForKey to define a value that the application read using NSUserDefaults? I haven't tried but it seemed that you cannot do that according to this: http://stackoverflow.com/questions/4977673/reading-preferences-set-by-uiautomations-uiaapplication-setpreferencesvaluefork But you're saying here that you should be able to do just that, I was wondering if you were able to try this? Yes, You can set a value in the nsuserdefaults. But when this value is a system value such as the language, you still have to manually relaunch the app for them to take effect. Hello, I tried the steps to change the language for UIAutomation. It changes the language, eg: I set the language as french and when I print "app.preferencesValueForKey('AppleLanguages')", I get french back as the language but if I run the test with it the text on the simulator remains English i.e. I cannot see the language change on the simulator. Did you face any similar issues? About step B you can take a look at iTunes transporter. http://stackoverflow.com/questions/13191678/where-to-find-apples-new-command-line-delivery-tool-transporter With some additional script to create packages you can upload screenshots/descriptions/whats new automatically. Check out this new tool: https://github.com/KrauseFx/snapshot it does screen shots with a single command line command!